I'm sure that most of you, being Excel geeks like me, have heard about the technique to create so-called "in-cell" charts in Excel. The guys over at Juicy Analytics recently had a couple of posts on this subject that garnered a great deal of attention from fellow bloggers, with some people going as far as saying that this technique is superior to the built in feature to be included in Excel 12. I'll hold judgment there until I've personally had more time with Excel 12, but for right now, this in-cell charting technique is certainly a quick, easy, light-weight (to steal a term from the JA guys) means to do some fairly powerful data visualizations. I thought I'd post a demonstration of how using this technique, one can create in-cell "tornado charts" -- a type of chart commonly used to visually depict various data points for two different groups. 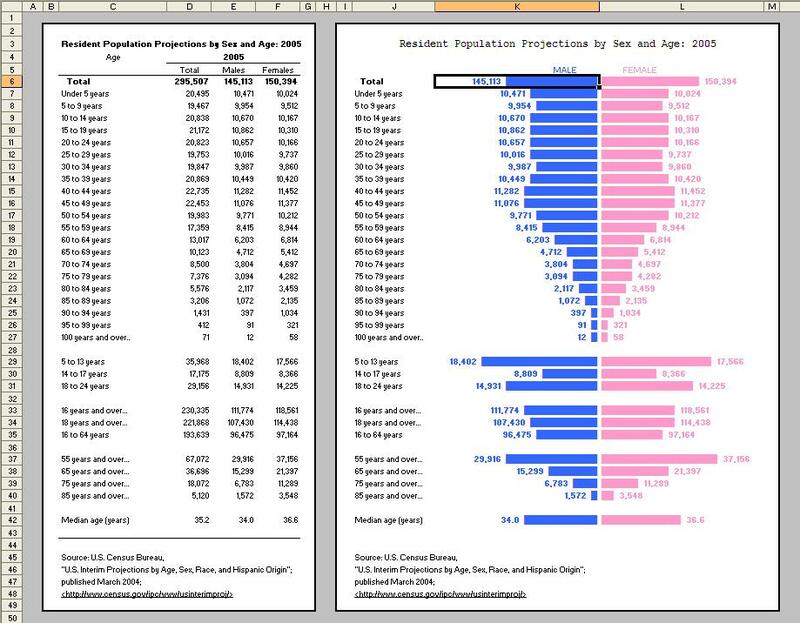 John Peltier's site shows a nice example of using Excel charts to create tornado charts, which I in no way want to diminish, but here's a simple example of using in-cell charting to do it, too. See how much more visually appealing data can be in this style of chart? The special, rectangular character is ASCII code 219. It seems simple and I'm actually a bit embarrassed about it, but it was only recently that I learned that one can use ASCII codes directly in formulas (and in most applications, actually) by simply holding down the ALT key and typing the numeric code. Huh. █ I just did it again. Simple. Anyway, this code provides a nice solid bar. The cell E6 contains the value I'm visually representing with the bar. Note that I use the FIXED function to display the whole numbers with the commas -- followed by a couple of spaces, then I repeat the ASCII code 219 to make the bar in the chart. Note that I divide the value by 10,000 so that the bar is not too long, then I roundup that value to the nearest whole number. What rounding up in this manner prevents is a situation where, say, the data is 219, and I'm dividing it by 10,000, which if simply rounded to the nearest whole number would result in zero, and therefore show no bar at all, despite there being data greater than zero. Rounding up provides at least one character in the bar to represent relatively small data points. In the bars immediately following, I divide by only 1,000. Later on, I divide by 2,000, and on the last one, I divide by only 3. Each group is obviously showing a different scale, but it looks nice this way, and still maintains the visual comparison between the MALE and FEMALE data points. Note that in this formula the bar comes before the value it represents (since it's on the right), and I align these cells to the left. BLUE vs. PINK color-coding for MALE vs. FEMALE is typical (at least in the United States), so I thought that was a nice touch. This example is a fairly large chart, but one of the really nice applications for in-cell charting is dashboard reporting, where many times you're trying to squeeze eight or ten or sixteen individual charts into a one page document. In-cell charts can fit that bill very nicely. I'm very curious to learn if any of you have done cool things with this in-cell charting technique, so please pass along any thoughts or examples -- via commenting on this post, emailing me, or by using my Meebo Me chat feature (Like how it now scrolls up and down with you?). I'll be sending out this example file to my Excel_Geek Insiders subscribers for their enjoyment, as well. I just recently completed an enhancement on a business form I'd done for an Excel_Geek $50 Project customer from a few months back. John is in the insurance business, and wanted me to replicate in Excel a manual, paper form they use, so that it would be easier/quicker to fill out, not to mention neater when printed out. I think what I created illustrates several of the key reasons why using Excel to recreate otherwise manual, paper business forms makes good sense. Using worksheet protection, we can keep users from inadvertently "breaking" the form. Using conditional formating, we can visually cue users which areas in the form they can or need to edit or input data. And finally, perhaps one of the most compelling reasons to use Excel to recreate manual business forms is that one can use formulas to automate otherwise tedious calculcations. All of this, and not a single line of VBA! Thank you, John, for joining the ranks of the Excel_Geek repeat customer club, and to all of my Insiders subscribers, enjoy this file. To those of you who haven't yet subscribed to the Insiders program, did you know that when you do, you will receive copies of all the $50 Projects I do for others for a year? All for $39.95 per year. That's right. If I do, say, 20 projects per year, you'll get all 20 for less than $2 each. Why would I give to you for nearly free something for which I charged someone else $50? I little economic principle called "marginal benefit." You see, I've already done the real work, which was paid for, so anything additional I get for that work (while merely having to deliver the product via email) has a relatively high net marginal benefit. Besides, how long do you really think I can offer services worth over $100 per hour for a $50 flat fee without some other revenue streams? After all, there is no such thing as a free lunch. Can you believe the value! Fantastic examples of Excel and VBA projects AND brilliant lessons in economics, too?!? HA! ;-) Just sign up as an Insider today (if you haven't already)!